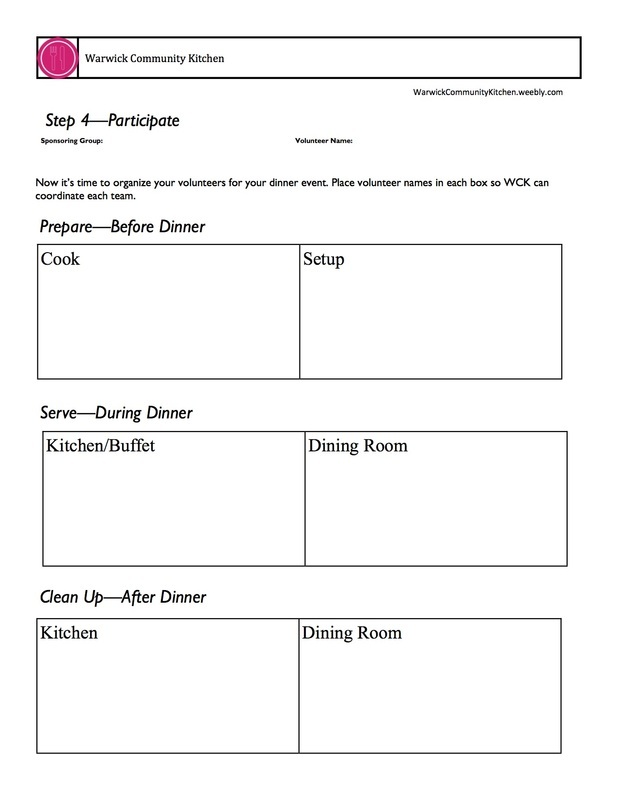 Are you interested in sponsoring a dinner at the Warwick Community Kitchen? We have designed a Sponsor Kit to help you step through the process. Click on the pages below to get more information and to start on a journey with us. All sponsors of our monthly dinners will be featured, along with their link, on this page. Glenn P. & Susan D. Dickes - Thank you to Mr. & Mrs. Dickes, who have become a major financial sponsor of the Warwick Community Kitchen with an initial contribution of $1,000.00. Warwick Sanitation - Thank you to Guy Bogart and Warwick Sanitation for the donation of all garbage removal for every monthly dinner. Lora McDonald and Members of the Warwick Community - Thank you to Lora McDonald as well as her family and friends of the Warwick Community for sponsoring the April 2012 dinner. Vicky at Headlines Salon and Members of the Warwick Community - Thank you to Vicky, her family and her friends for sponsoring the May 2012 dinner. Acute Care and Inpatient Rehabilitation Department of Orange Regional Medical Center - Thank you to the employees of the Acute Care and Inpatient Rehab departments of ORMC for sponsoring the June 17, 2012 dinner. CJ's Country Market - Thank you to the owners of CJ's Country Market of Pine Island, New York, for sponsoring the October 19, 2012, January 16, 2015, and January 15, 2016, dinners. Janet's Quality Baked Goods - Thank you to Janet Picarelli, owner of Janet's Quality Baked Goods, for the donation of the dinner rolls, Florida, New York. Fresh Baked Artisan Breads and Treats-All items are scratch made- no additives or chemicals! (24 hours’ notice needed for special orders). Town Councilmen Mickey Shuback and Floyd DeAngelo - Thank you to Town Councilmen Mickey Shuback and Floyd DeAngelo for sponsoring the June 2013 dinner. M&M Farms - Thank you to M&M Farms in Pine Island, New York, for their donation of potatoes for the July 21, 2013, dinner. 845-258-4939. Dagele Brothers Produce - Thank you to Frank and Chris Dagele for donating the produce for the salad for the July 21, 2013, dinner. 845-651-4590. S&SO Produce - Thank you to S&SO Produce for donating the produce for the salad for the August 18, 2013, dinner. 845-651-4494. Stewart's Shops - Thank you to Stewart's Shops in Goshen, NY, for donating the Ice Cream Sundaes. 845-294-6307. ShopRite of Warwick - Thank you to ShopRite of Warwick, NY, for donating items for each of the dinners since September 2013. 845-987-1200. Thank you to James and Donna Scheuermann for donating all of the silverware, cups, napkins, dinner plates, bowls, dessert plates, salt and pepper packets and the serving utensils for the November 2011 dinner. Thank you also for the donation of an electric knife and electric can opener. Thank you to the numerous donations from the members of Vision Community Church. 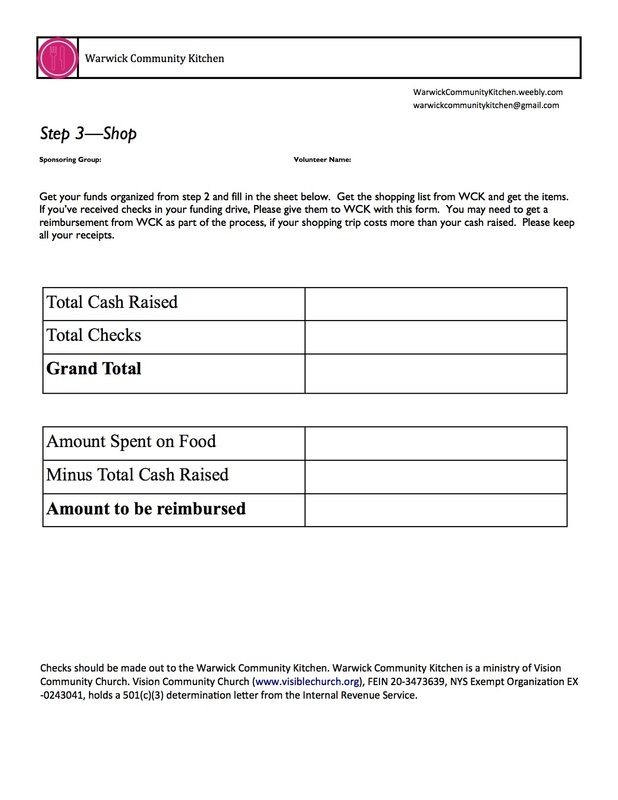 Thank you for all donations from members of the Warwick Community.